Kerala, a tropical state on India's Malabar Coast, is among the most popular tourist destinations in the country. Its distinctive culture and extremely picturesque setting—which contrasts with the fast-paced modern world—make Kerala an indulgent place to go to relax, similar to places like Bali and Tahiti. However, there's no shortage of things to do should you grow bored of your beachside slumber. Attend a traditional Kathakali dance performance, cruise the backwaters on a houseboat, or take an afternoon to go tea tasting. A trip to Kerala is not complete without experiencing the Kerala backwaters. The lush palm-fringed landscape, diverse wildlife, and houses and villages that line the backwaters make a houseboat cruise seem like a journey to another world. It's a tranquil endeavor, for sure, one that can be part of a memorable romantic getaway. Book a hotel or homestay along the route to immerse yourself in the culture that surrounds these inland lagoons, lakes, and waterways. Kerala's famous backwaters are dotted with small villages full of vibrant local people and customs. Visiting them just makes time stand still. Enjoy a meal with a local family while learning about their life story. Kumbalanghi Village Tours offers group tours to Kumbalanghi, an area surrounded by paddy fields on the outskirts of Kochi. Here you can see India's first model fishery and tourism village and engage with the locals who make their living off of agriculture and fishing. Ayurveda, an ancient Indian healing tradition that's over 5,000 years old, combines lifestyle practices with yoga and healthy eating. Many Ayurvedic spas and resorts are located in Kerala due to its warm climate and the abundant supply of medicinal plants. A trip to an Ayurvedic healing center can involve a week's stay and detox (called panchakarma), where the liver is purged and the body becomes renewed. Or, you can book any one of their offered treatments, like an oil massage or a Shirodhara, a relaxing treatment that involves dripping warm oil onto the forehead—a remedy for insomnia, tinnitus, neurological disorders, and psoriasis. Kerala is renowned for its delicious cuisine, featuring regional delicacies like seafood and coconuts. And sure, simply feasting on this Indian fare is delightful, but learning how to cook it is rewarding and gives you a skill you can bring back home. Enroll in a cooking class or even plan your trip around it by booking a two or three-day residency program that involves cooking classes and Ayurvedic treatments. You can also go casual for a more intimate experience and learn how to cook with a local family. Kathakali is a very unusual and ancient form of dance-drama that's traditional to Kerala. And you won't get to see performers dressed up like this every day! The elaborate costumes and subtle dance movements tell a meaningful Hindu mythological story. Performers undergo intense training, including hours of eye exercises, when learning the art of Kathakali. Stop into the Cochin Cultural Center or the Kerala Kathakali Center to see a performance. 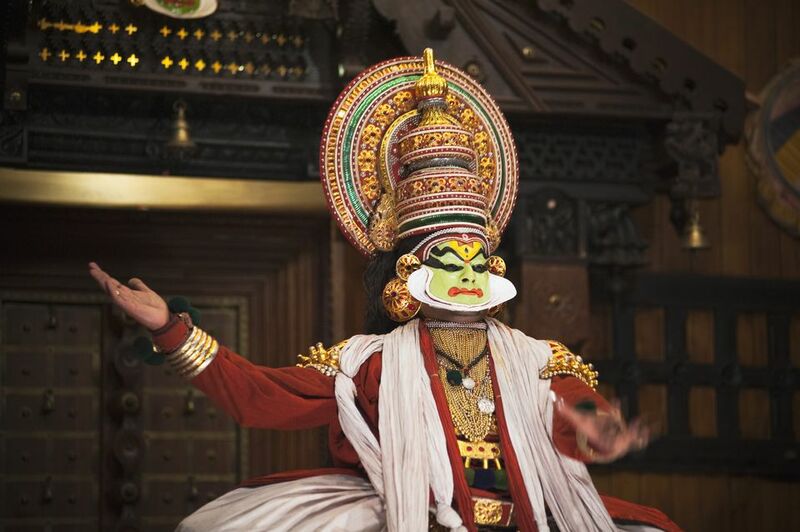 Or try a private tour of Kochi and that culminates with a Kathakali dance performance. The small town of Kannur, once an ancient trading port in northern Kerala, boasts secluded beaches, elaborate handloom weaving crafts, and mysteriously masked theyyam rituals. This practice encompasses dance, music, and mime to bring to life the rich stories of the state of Kerala. The theyyam artform actually has a season, too, running from October until May. Kerala Tourism provides a comprehensive calendar of theyyam events or you can take an overnight guided theyyam tour from Kannur. Kalaripayattu is an ancient martial art form practiced in Kerala. Featuring strikes, kicks, grappling, preset forms, weaponry, and even healing methods, its roots can be traced back to 2000 B.C. Attend a 60-minute fighting demonstration that includes the lighting of traditional lamps, a flower offering to a deity, and a brief introduction of the sport. With the incorporation of about 27 different weapons, there will be no shortage of excitement. Catch a performance at the Kadathanadan Kalari Center in Thekkady or book a group tour from Kochi. Every year during the monsoon season Kerala comes alive with colorful snake boat races. One-hundred-and-forty-foot-long canoe-like boats holding 110 rowers each get together to race along the inland waterways. All of the villages have their own snake boat, each with varied size and style. And both the building of the boats and the celebratory event is a unique part of a culture that joins community with water. Today, snake boat races can be compared to an Olympic event, complete with leagues and scheduled tournaments. Tea production is big business in Kerala. In fact, the state holds two of the top five tea plantations in India—Munnar and Wayanad. Stay in typical atmospheric accommodations on a serene tea plantation. (You can even book a treehouse!) Then, explore the surrounding hills with daily hikes topped off with tea tasting. Check out the Tea Museum at Nallathanni Estate in Munnar to get a peek inside the history of tea production. Toddy, or palm wine, Kerala's indigenous alcoholic drink, is made from the sap of palm trees. The sap is collected from a coconut palm by a tapper who climbs the tree and drains it into a container. This sweet nectar, when fermented, turns slightly tart and has a kick. Toddy (traditionally called kallu) is served in small thatched shops—usually with wooden benches—all over Kerala. Inside, you'll find tasty Kerala cuisine dished up alongside the toddy, and, as they say, "the hotter the food, the more you need to drink." Known as the "Gateway to Kerala," Kochi is an enchanting city with an eclectic influence. Arabs, British, Dutch, Chinese, and Portuguese culture all have left their mark. The architecture and historical sites in Fort Kochi draw most of the visitors to the area. Explore Fort Kochi and its Chinese fishing nets, Jewish Synagogue, and Mattancherry palaces by foot or bicycle. Or book a three-hour walking tour of the site. Hotels and homestays that suit all types of budgets can also be found in Kochi. Multi-cultural Muziris, located about an hour north of Kochi, was historically one of the most important trading ports in Kerala. Businesses thrived here for more than 1,000 years prior to a flood that caused severe damage to the city. The Muzuris area encompasses Kodungallur and Paravoor and is full of old churches, synagogues, mosques, and temples. The first mosque in India—Cheraman Juma Masjid—is a fascinating place to visit. Book a tour or wander the streets on your own to experience ancient Indian culture. Kerala temple festivals, which highlight India's most prized animal, the elephant, pay tribute to the presiding local god or goddess. Watch large processions of bejeweled elephants, drummers, musicians, and colorful floats carrying gods and goddesses around the harvest season in March and April. The largest festivals take place in the Thrissur and Palakkad districts in northern and central Kerala, but many small temples throughout the state offer small-scale festivities if you're not one for noisy crowds. The beaches in Kerala are crowd-free and undeveloped, making them more desirable than beaches in the more touristy areas of India. Some boast lighthouses and facilities and others can only be accessed by boat. Varkala beach, a favorite of travelers, has a spectacular cliff setting and is lined in beach shacks and shops. Stay up high on the cliff and take in the view. If you're looking for action, head to Kovalam beach near the capital city of Trivandrum. However, do note that this beach is among the busiest in the state. Periyar National Park, one of Kerala most magnificent attractions, lies on the banks of a large artificial lake. Complete with hilly forests and a plethora of wildlife, it's the most popular national park in southern India. Periyar, unlike other national parks in southern India, stays open during monsoon season and offers a wide range of eco-tourism activities, so you can really explore nature. Book a stay during this low time for a budget-worthy trip. The colorful Kerala mural paintings seen on the walls of temples, churches, and palaces date back to the ninth century. The oldest of these murals lies in the rock-cut cave temple of Thirunandikkara (now in the Kanyakumari district of Tamil Nadu), where only sketchy outlines remain. The largest mural panel in the state (coming in at 49 square meters) is at Krishnapuram Palace near Kayamkulam. Extensive murals depicting scenes from the Hindu epics are preserved at Mattancherry Palace in Kochi. And the murals of the Shiva Temple in Ettumanoor provide insight into the earliest forms of Dravidian mural art. Other famous mural paintings can be found at the Padmanabha temple in Trivandrum and Vadakkumnatha temple in Thrissur. Nothing makes a trip more memorable than getting up close and personal with the largest mammals on earth. At Elephant Junction in Thekkady, you can ride on an elephant and even bathe with one. The resort's various programs include both of these delights, in addition to an elephant feeding and photo session and complimentary tea or coffee. A full day program includes tours of the on-site plantation, cardamom processing, and timber dragging. Stay at their Treetop Hotel for a three-star experience, complete with a multicultural restaurant and Ayurvedic massage offerings. Two amazing Kerala waterfalls are located within a 55-kilometer drive from the Cochin airport: Athirappally and Vazhachal. Athirappally Falls, the bigger of the two, cascades from a height of 80 feet and resembles Niagara Falls during monsoon season. However, heavy rains can cause disruptions in travel during this season, making the best time to visit between the months of September and October. Five kilometers down the road lies Vazhachal Falls. While the drop on this waterfall is not as spectacular, it's every bit as majestical as Athirappally Falls and a great place to picnic. Swimming and bathing are prohibited underneath both of the falls, but at Athirappally, you can take a careful dip upriver before the falls plunge. When's the Best Time to Visit Kerala? Not sure when to visit Kerala? Kerala has something to offer all year round. The weather does need to be taken into account though, as the climate is a hot tropical one that receives rainfall from two monsoons.